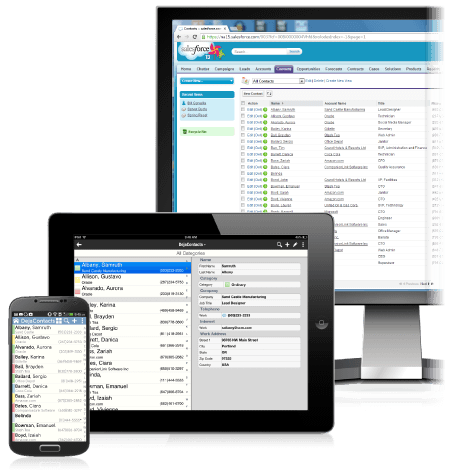 Sync Salesforce CRM to your phone, tablet, Google and Office 365? Contacts, accounts, opportunities, calendar, tasks, and notes. Salesforce data is stored on devices for offline use and integration with Caller ID, mobile email, and maps. CompanionLink keeps the Salesforce.com Sales Cloud tightly integrated with Android, iPhone, iPad, Windows Phone, and BlackBerry devices. Our mobile app, called DejaOffice CRM, holds Salesforce data for a fast and intuitive CRM experience on your mobile without the lag and latency involved with other solutions that offer just web-based access to your CRM data. You can also synchronize with other products like Microsoft Outlook and IBM Notes, or cloud services like Gmail, Google Apps, and Office 365 accounts. Three components work together to keep everything syncrhonized: CompanionLink desktop software, our DejaCloud wireless service, and our DejaOffice CRM mobile app. All three are available for a one-time license or subscription - choose the model that works for you!